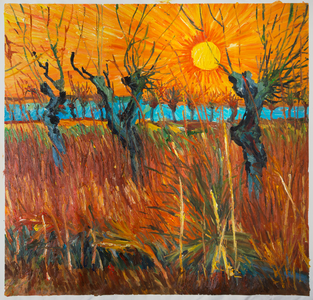 Painted in 1888, Vincent Van Gogh delivers a heightened sense of inner vibrancy within his Willows at Sunset. The ability to create an energetic impact, while also being able to have a sense of subdued harmony, makes Mr. Van Gogh a true genius. If you notice closely, Vincent Van Gogh employs the brushstrokes in a mostly vertical style. The sun, which is clearly revered in this painting, does not participate in this artistic technique. Bringing darker tones from the ground towards a bright sun has deep meaning. One can interpret the Willows at Sunset as a person's journey through life. While a meandering darkness prevails from the ground, Mr. Van Gogh interweaves our joys through lighter colors in between. A sense of hope for a brighter ascension towards the sky ultimately decides this miraculous composition, but with his trademark hint of dark stems trying to cover the sun. A sublime bright light of hope. The trees depicted here look a bit sinister, as if they represent every person's mid-life crises, enforcing a blow towards a person through negativity. Vividly striking this attack towards the human heart through vertical means, a blue river horizontally passes through calmly. This water bridges a gap between the rigorous uneasiness of life with the sublime bright light of hope. Vincent Van Gogh's palette is blatantly ferocious in this painting. He had an ability to create works in a short period of time, like a bolt of lightning. There is nothing more needed to be painted in the Willows at Sunset. A truly powerful example of a work that will leave a mark. While most people thought Vincent Van Gogh's isolation was a mark of insanity, the true artists of all kind understand how much time is needed to create something worthwhile. Being able to work on a project for humankind is a gift. This treasure was done for them and inside these gems are a whole world explained. One can study Willows at Sunset forever. While the painting stays the same, hopefully we grow as individuals, being able to find some new mysterious opening within this masterpiece.